Following a lovely luxury cruise aboard Seabourn’s latest Seabourn Encore, it was time to return home to San Diego from Barcelona, with a layover in New York City. That meant an eight hour or so international leg across the pond aboard an Airbus A330-300 in Comfort+ class with my preferred carrier of Delta Air Lines, which once again proved dutifully up to the task. There was a lot of chatter during the prior week about the Trump administration’s electronics ban potentially expanding to US-bound flights from Europe, and I was concerned that my laptop and camera equipment would be forced into checked baggage. Thankfully, that was not the case, at least not for now. However, I was not able to check in online, as I was apparently required by government regulation to do so in person, despite the fact my mother—on a separate reservation but same flight—was able to electronically with no hiccups at all. As I had to drop off checked bags at the terminal, the extra step was really no trouble, especially since my Platinum status in the Delta SkyMiles program allows expedited SkyPriority access to an agent. The gentleman at the counter was easily the most helpful I've ever encountered internationally, and he made quick work of tagging our luggage and getting us Fast Lane security passes. With no electronics ban in place and our fast access, general security was relatively painless since there was just a TSA Precheck-style metal detector and X-ray machine for our carryons to go through. With only my belt and watch removed, and my laptop and iPhone placed separately, the process was swift. Only passport control that followed took a bit longer, but once they opened more lanes, even that sped up. The only somewhat annoying extra bit was being randomly selected as we approached the gate itself for additional screening. We were told that it was under US government TSA protocol—and likely added scrutiny since electronics recently became more heavily discussed—that we and our belongings were swabbed for explosives. I also had to turn on my camera, and my shoes were put through an X-ray machine as well. Once finally seated at the terminal, there was honestly very little to do. Per the recommendation of the agent who checked us in, we did not head to the lounge, which he said was not worthwhile going to for the short time we had prior to taking off. In fact, it was not a Delta-branded SkyClub anyways but rather an independently operated one. I might have had free access, but I may not have been able to extend that to my mother as a guest as I can ordinary with Delta. So, we decided to simply sit near the gate where there was but one coffee house and at least free internet access to download a new television episode for the flight. It was interesting to note that one of the gate agents had several paddle signs indicating the different zones being called, ensuring everyone in line knew which was then entering. It was a nice touch that would go a long way at other gates around the world. Once on the plane, the benefits of Comfort+ were immediately apparent. It’s amazing how a couple extra inches in length can beneficially add to your personal bubble—although I much prefer that bonus in width. With yours truly at the aisle and my mother just to my left in the first center seat, we did luck out with the center seat next to her being unoccupied, which gave us both more elbow room. Rounding out the helpful seat inclusions were USB charging ports as well as electrical outlets. It’s always a joy to fully charge your electronic devices—whether that be an iPhone or MacBook Pro, a 13” screen of which I was able to open up all the way without restriction thanks to Comfort+. Thinking ahead to a time when larger electronics might unfortunately be disallowed from cabins, I’m even more thankful for the robust seat-back entertainment systems in place on Delta planes now. 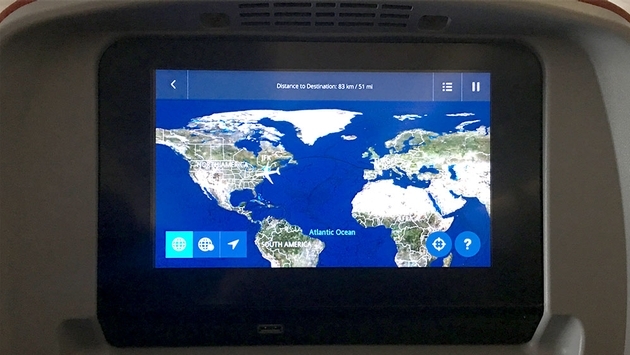 The moderate-resolution touch-screen interface is intuitive, and the library of movies, TV shows and music is kept mostly well updated with plenty of selections—decent even for frequent fliers. Meal choices could be changed out more frequently, however. The two warm and singular cold salad entrees are becoming very predictable now. Generally, they are a chilled chicken salad or a hot chicken or pasta course. I went for the serviceable (but hardly cheesy) parmesan chicken with saffron risotto. On the side were a small side salad, pretzel roll and butter, piece of white cheddar cheese, table crackers and a dessert of black forest gateaux, which remains the highlight. About midway through the flight, you can never go wrong with a snack in the form of an ice cream cup. Before landing, a secondary meal of a mozzarella and tomato sandwich, and chocolate and salted caramel cup is again an improvement over the earlier main. Delta service is always solid and friendly. It’s great how frequently attendants service the cabin with regular food and drink but also full bottled waters as well as hot towels to refresh by. This time around, I have to give the most props to the overall team, especially because of Barcelona's check-in agent who was downright exceptional. Delta consistently stays on par and even finds ways to raise the bar where it can, and that’s why I stay loyal to the brand. During a time of uncertainty when it comes to in-flight electronics productivity and entertainment, I at least know Delta will be there to offer the best solutions in either case.